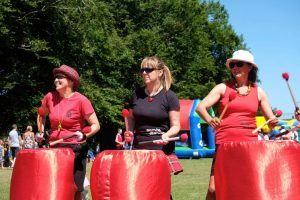 The Samba Sisters play regularly at a variety of events including local gala days, summer solstices, ceilidhs, festivals and cabarets. We have played in rain, hail, snow and sunshine on backs of trailers, lorries, bandstands and stages to an audience of hundreds and to one man and his dog – but no matter what the event we play with enthusiasm and we keep on smiling! 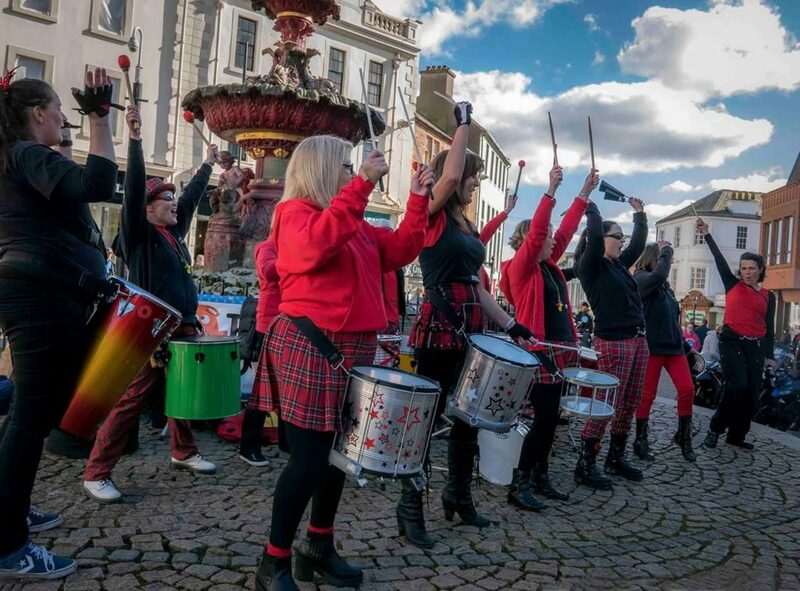 Back in 2003 a women’s drumming group, The Belties were struggling to survive in Castle Douglas, numbers had been falling and the decision was made to split the band in two, one half to go further west to Newton Stewart and the other half to come to Dumfries. So with a few drums, bells, tambarims and six women we started of building a new drumming band. As numbers steadily increased we were able to think about performing in public. Carlisle was our first venture but first we needed a name – after much discussion and many suggestions one of our members at the time, Ev came up with “The Samba Sisters” and the rest as they say is history. The Samba Sisters have gone from strength to strength both in numbers and playing ability – adding new Samba and Brazilian numbers to the repertoire each year.